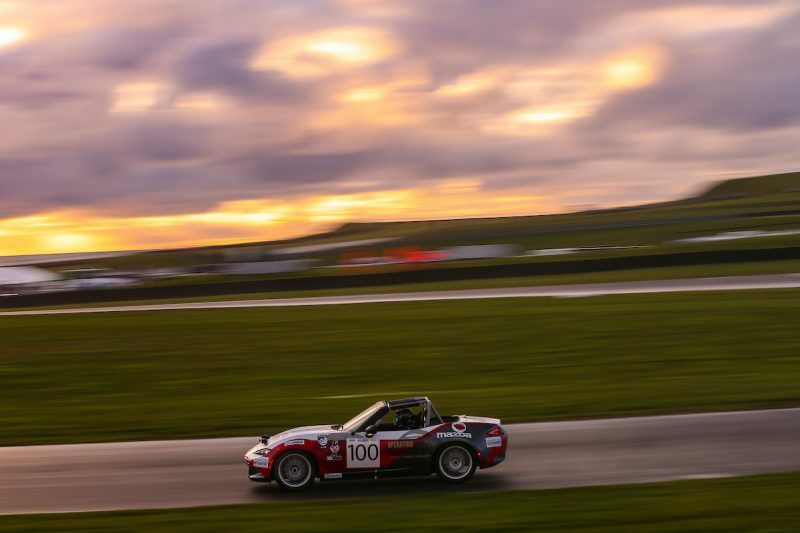 Like all decent pastimes, motor-racing is many things. It is exhilarating, challenging, rewarding, fun and can thrill you went it goes well as it can get you down when it does not. But, if I’m being honest, it is rarely, if ever, important. 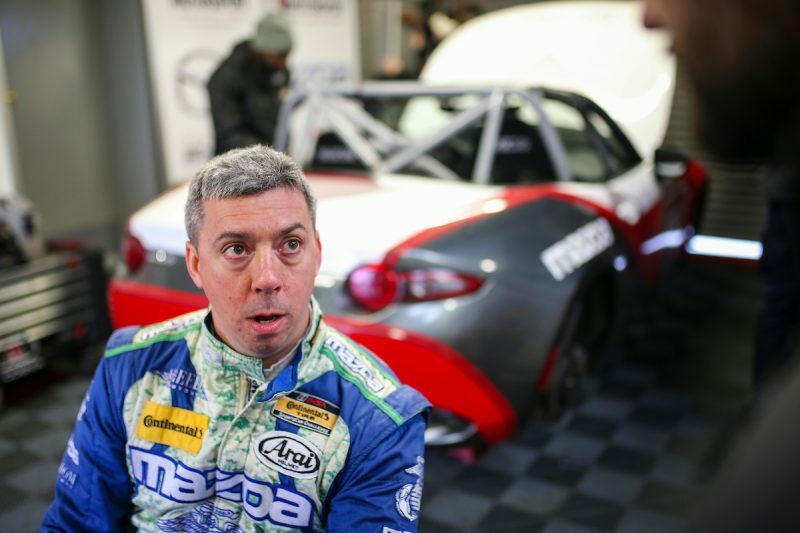 I’ve been racing cars for 25 years – including three 24 hour races in various Mazdas – but while racing undoubtedly has a certain addictive quality to it, I’ve never seen in make a difference to anyone’s life. That is until last year. 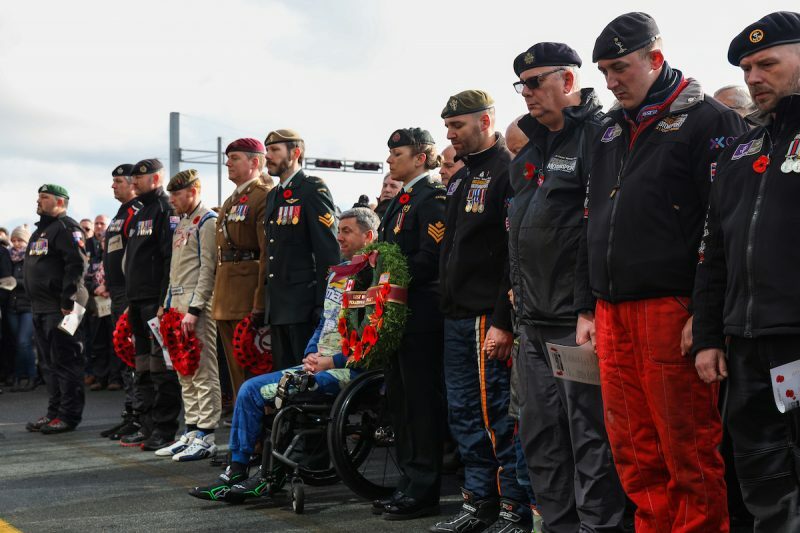 Last year a Forces Charity called Mission Motorsport invited me to take part in an event called the Race of Remembrance. 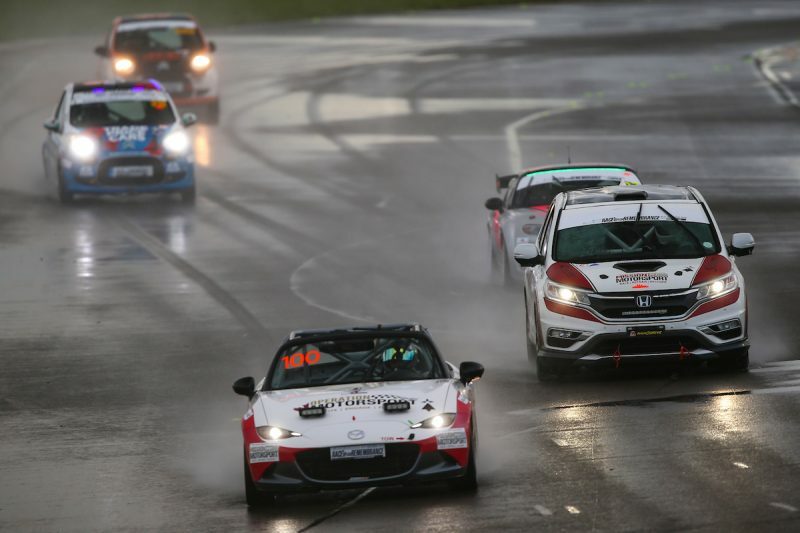 It’s a 12 hour race that runs over the Remembrance Sunday weekend in November at the Anglesey Circuit. The cars race for six hours on Saturday afternoon and evening, mainly in the dark, then park up to resume on Sunday morning but pausing again for a service of remembrance in the pit-lane at 11.00am. I was delighted to be asked: it was clearly a good cause and an entirely unexpected bit of late season racing. And other than noting it in my diary I really didn’t give it much additional thought. If you’d told me then that it would slightly but significantly change my life, I’d not have had the faintest clue what you were talking about. But up there on that freezing windswept island, people I’d known only as nameless headlines and stories in newspapers became real. People like my team mates Paul Vice and Andy Jones. Vicey (as he’s known) was a Marine, Andy a paratrooper. Vicey is short and wiry, Andy is the size of a block of flats. What they have in common is that both were blown up by Improvised Explosive Devices in Afghanistan. Vicey should be dead. In the period after the bomb went off and the medics got him stable he had a stroke, his heart stopped twice, he suffered irreparable brain damage, lost part of his hearing and sight, was paralysed down one side and lost so much blood the flying hospital helicopter that rescued him literally ran out of blood trying to save him. After he was stabilised they pulled 400 lumps of shrapnel out of his body. And amputated one of his legs. By any other measure Jones’ physical injuries would be horrendous: the IED was deliberately detonated as he walked past, sending all manner of objects through his lower limbs. The insurgents pack these crude and evil devices with anything they can find, which is why Andy has the probably unique experience of looking down at his left thigh and see the inlet manifold from a car engine sticking out of it. Miraculously he kept his legs and recovered well from his physical injuries, but mentally he was utterly traumatised. He was medically discharged from the Army, his marriage collapsed and within weeks this once proud member of one of the world’s most elite regiments was homeless, living out of bin bags. 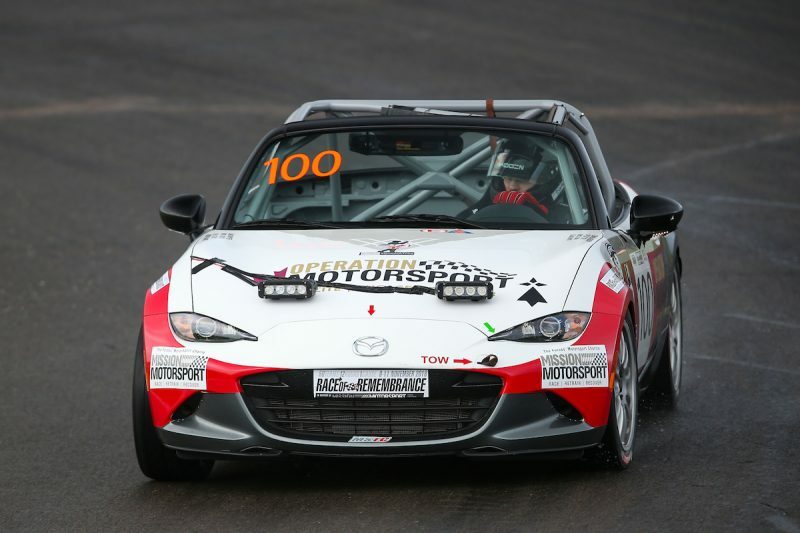 By the time of last year’s event Andy had been picked up by Mission Motorsport and was getting better, but he was still unbelievably fragile and when in qualifying he had a completely harmless spin in the MkIII MX-5 we were sharing, it near enough ruined him. 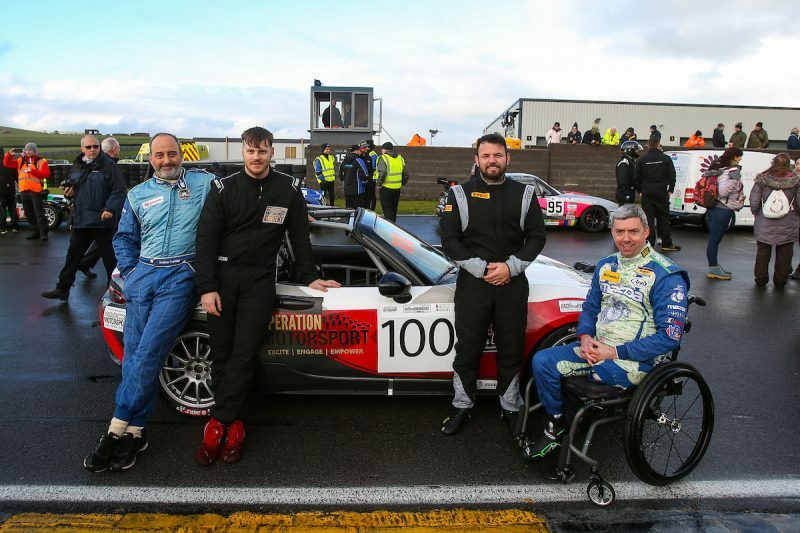 It took all the skill of Mission Motorsport’s occupational therapists to bring him round and many hours of patient listening and understanding from the veterans who run Mission Motorsport before he could be persuaded even to think about getting back in the car. I have rarely been prouder of anyone when I saw him drive it over the line at the end of last year’s race having not put a foot wrong all race. So the good folk of Mission Motorsport thought that, for this year, it would be a good idea to put the band back together, but with a twist. 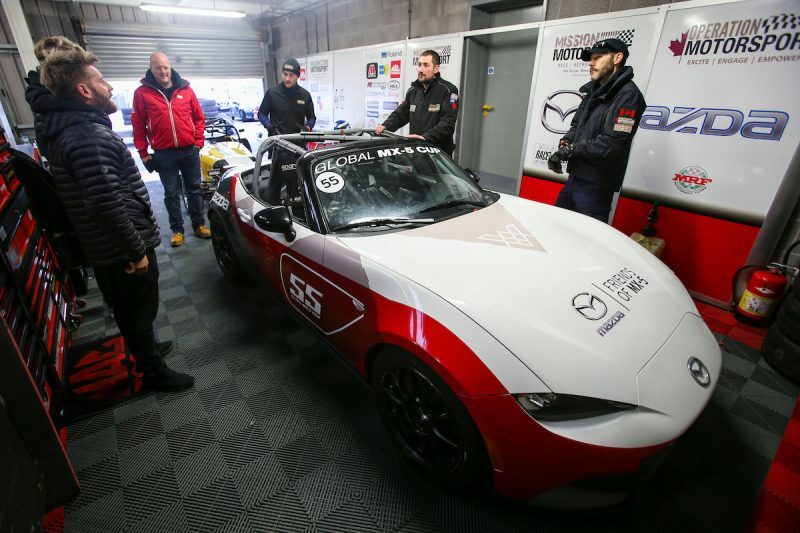 Andy, Vicey and I were to be reunited to race an MX-5 again, but not only would it be a brand new MX-5 Global Cup racing car rather than an old road car converted to race specification, but we’d have a new team-mate too. Enter from across the Atlantic, US Marine Liam Dwyer. He came complete with MM’s Canadian/American sister organisation Operation Motorsport and we would all in effect be racing for them. If you look at a photograph of Liam, you can clearly see he is an above the knee amputee, but you need to get up close before you realise there is barely a part of him that was not ravaged when his luck ran out in Afghanistan. I’ll spare you the details and share only that to date he’s had over 50 operations and leave your imagination to fill in the blanks. For reasons altogether too boring to go into, our weekend started entirely on the back foot when the car turned up at the last minute. 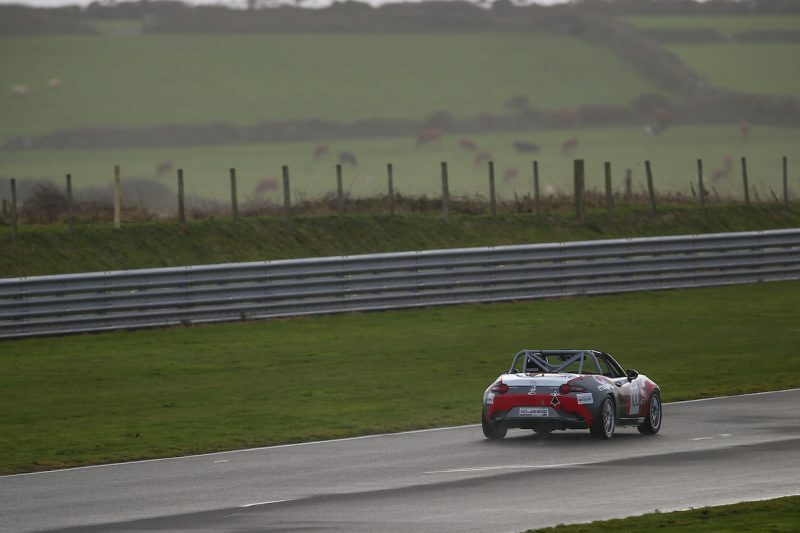 Our race car was brand new which was excellent (though MX-5s are usually faultlessly reliable even after many years of endurance racing), but it only got to Anglesey on the morning of qualifying. Which was very, very bad. For it meant we’d had no time to test or tune the car’s suspension for the race – a very necessary part of the preparation particularly when we knew the race would be cold and wet. 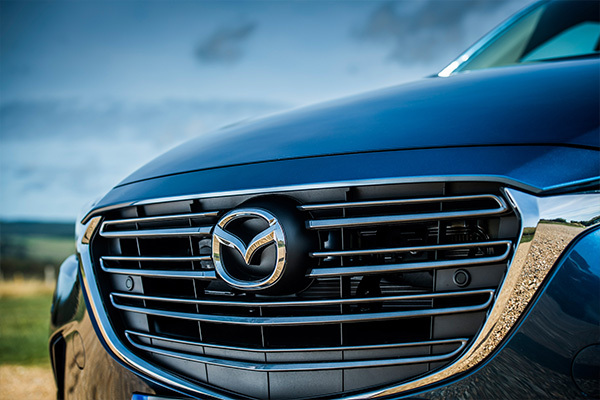 For those conditions you need to make the car as soft as possible which aids traction and makes it want to slide gently rather than skid violently. But all cars are different and need individual tuning to extract the most from them. 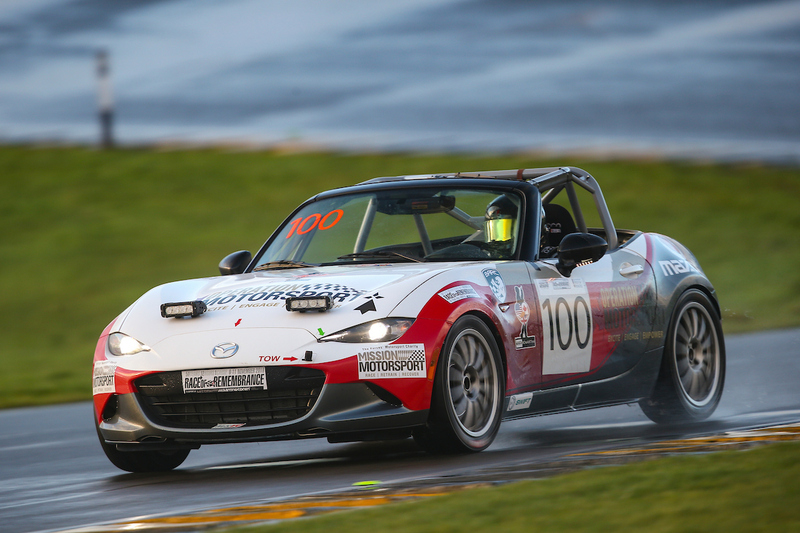 Secondly Global Cup MX-5s are designed to work on treadless slick racing tyres, which are not allowed in the Race of Remembrance, and the tyres we did have were designed for warm, dry track days, which didn’t exactly describe conditions on Anglesey in November. At times the track was flooded. But it’s a beautiful thing, complete with full race suspension, racing brakes, a reassuringly substantial and professionally fitted roll cage and an LCD dashboard. However before Liam could drive it, we needed to change the gearbox: he can handle a clutch despite the absence of most of his left leg, but it is understandably very difficult for him. So a racing sequential gearbox from another company needed to be fitted which meant the clutch would be needed only for driving away from the pits. The rest of the time you just tug the lever: when changing up you don’t even need to lift off the throttle. So far so good, but it meant the Mazda’s propshaft needed to be modified because as standard it would not fit into the new gearbox. 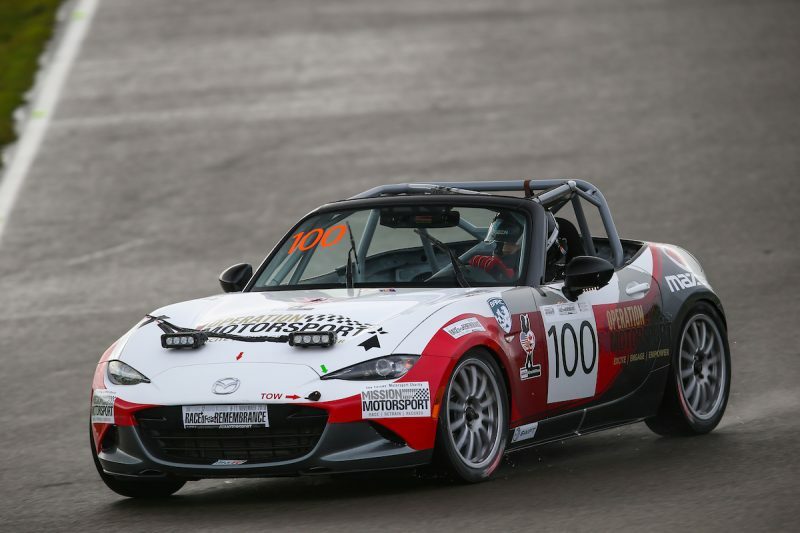 I am told this is only the second MX-5 Global Cup car to receive this modification. And our weekend started going wrong almost immediately. It was clear from the start that we had absolutely the right car in entirely the wrong conditions and, most of all, it was on the wrong tyres. We got the odd glimpse of how good it could have been when the track briefly dried just enough for the tyres to grip a little – which is how we ended up in the top third of the grid in qualifying – but even that session was curtailed: the propshaft had broken where it had been modified. It couldn’t be repaired but thankfully we had a spare. But as the car lined up for the start there wasn’t one reason any of us could think of why the new shaft would not go exactly the same way as the old. 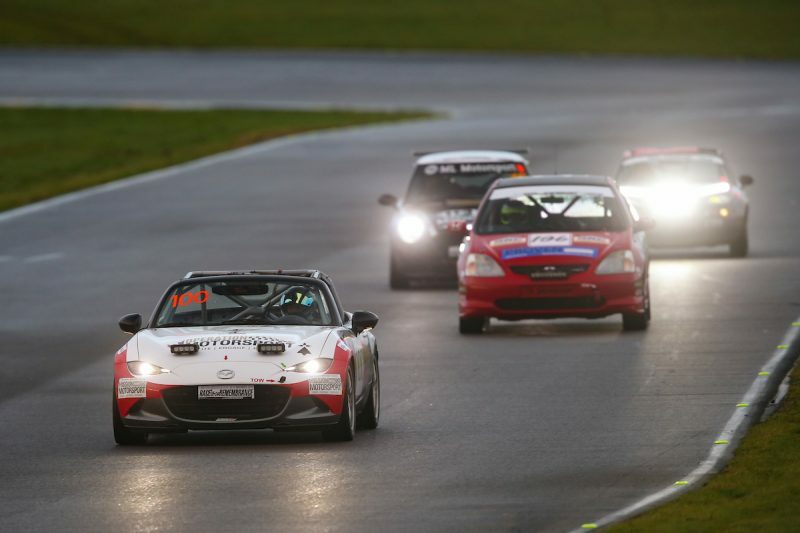 The race started in biblical rain, Vicey immediately electing to take what is always the toughest stint of all. We’d all agreed to do all we could to put as little stress on the transmission as possible, including using the clutch, though it wasn’t strictly needed. I was next up and drove from dusk into night time loving the car, getting slightly frustrated that its pace was limited by the fact it was wearing the wrong shoes, but still having a ball. Ninety minutes later I handed over to Andy, the car still running like a dream. And when he had a similarly uneventful session at the wheel and Liam disappeared off into the inky blackness, we allowed ourselves at least the hope that the propshaft might survive the race after all. Then the call came through: Liam was parked at the side of the track. We didn’t need to wait for the car to be recovered to know what had happened. Gearbox aside, there was literally only one non-Mazda approved part on that car, the bit on the end of the propshaft that allowed it to join said gearbox, and it had gone again. Our race was run. Did it matter? Normally I’d have been quite put out, but we’d all already had a lot of time in the car and thoroughly enjoyed driving it. Besides, there was rather more to think about at the Race of Remembrance than you usually get at race weekends. For the truth is it’s the one race that where you finish or even if you finish really doesn’t matter. It’s not about me. It’s about the dozens of beneficiaries of Mission Motorsport and Operation Motorsport, all veterans, all carrying terrible injuries, most of which cannot be seen. A few like Liam, Andy and Vicey were driving, but many more were working with teams in the pits, spannering cars, changing tyres, helping with refuelling. But what they were really doing was learning to work in a team again, to unite in a common cause, to feel the adrenalin flow again, to have a plan and execute it to the very best of their abilities, to feel part of a community of like-minded individuals again. And I’ll tell you this: if you could see the joy on their faces, hear how the Race of Remembrance provided them, even briefly, with that sense of purpose they thought they’d lost, you’d know that while racing may be a somewhat curious form of therapy, its efficacy cannot be doubted. Put it this way: at various points during the weekend, all three of my co-drivers said that they’d probably not be around now were it not for racing. Which is why the Race of Remembrance is that rarest of things: a race that actually matters. And it is why, come what may, I’ll be back next year. 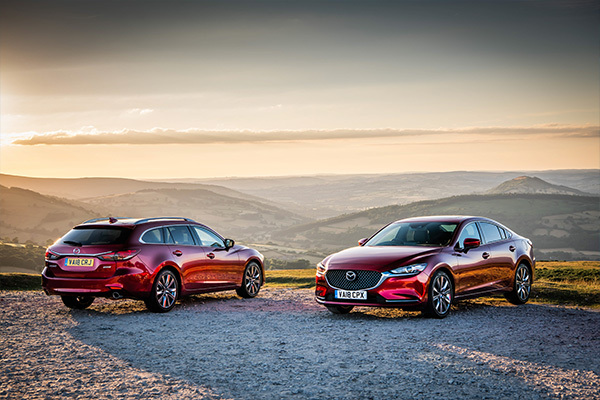 Mazda sponsors the 2nd Race of Remembrance and Mission Motorsport – The Forces’ Motorsport charity.